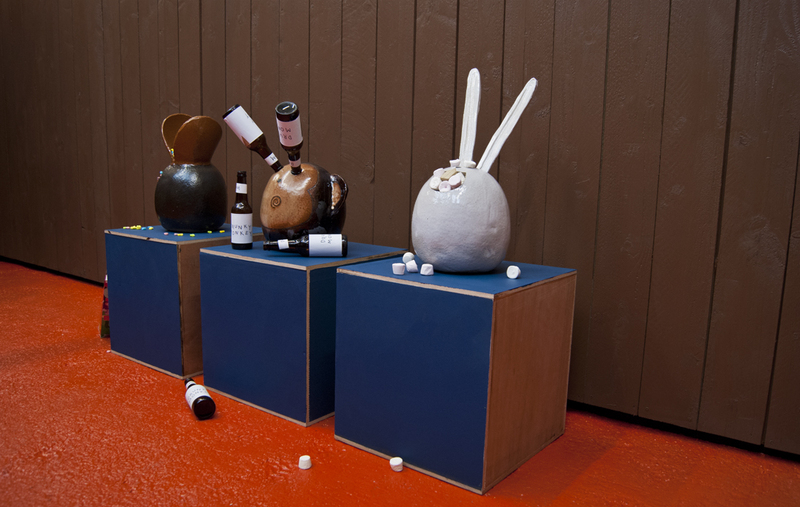 Aftertaste is a group exhibition featuring work by Juliet Fleming, Kieran Leach and Robyn Nichol, and seeks to question bad taste and use play as a tool. This exhibition was guest curated by Hannah Tolmie, an artist whose practice uses craft-based processes and ‘tacky’ materials to both celebrate and question the rise of kitsch-glam culture. The exhibition is currently on in The Trophy Room, an independent art space based in The Royal Standard, Liverpool. On arrival, the first thing you are hit by, literally, are the eyeballs rolling around on the floor. This is Kieran Leach’s work Eye Roll. It’s somewhere between a satire on surveillance technology and a literal rolling of the eyes at the familiarity of exhibition openings. It feels like an eternal sigh, a resistance of the serious. As a visitor, you continuously side-step and avoid being hit. It’s a new way of navigating an exhibition space, one which is much less polite. It makes you a clown, someone act the mercy of random movement. 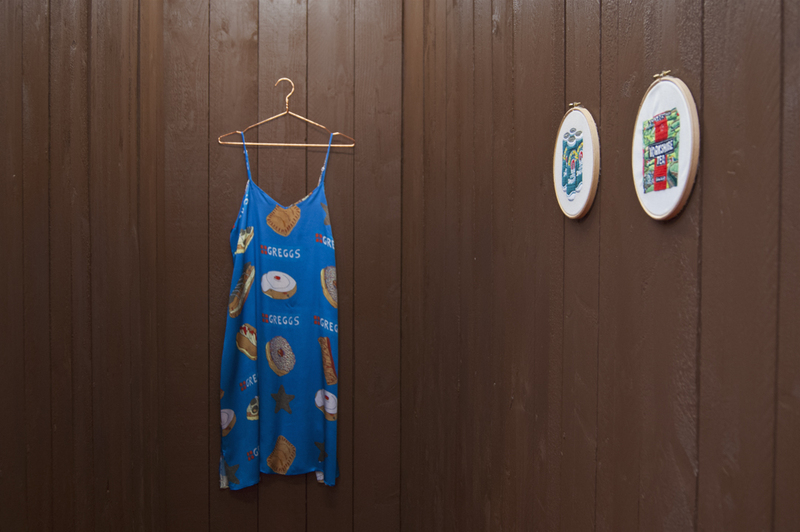 While trying to navigate this work, you are captured by Robyn Nichol’s Greggs Dress. It is exactly what the name suggests – a dress boasting the Greggs logo and images of the pastries sold there. Immediately relatable and covetable, the piece acts as the perfect summary of this idea of (good) bad taste. It exists so a love of savouries and cakes can be part of your aesthetic, however ironically or sincerely you wish to celebrate that fact. Most probably it will be with a touch of both. On the right sits Juliet Fleming’s Go Big or Go Home series; a series of three ceramic animal heads. Lucky Ducky’s beak is full of sweets, Drunky Monkey’s eyes are plugged with beer bottles, and Chubby Bunny’s face is stuffed with marshmallows. Like Greggs Dress, these objects are carefully crafted, but unlike traditional crafted works, we are constantly renegotiating our distance from them thanks to Eye Roll. Like endless scrolling through Instagram, this endless movement means your eyes can’t settle. Your mind, similarly, races around the exhibition. The Go Big or Go Home sculptures also seem to feel this anxiety, as their smiling faces tragically accept their precarious fate. Further embodying this precariousness are Nichol’s tapestries, which celebrate the culture of her childhood in Yorkshire. Jane Norman bags, the Chuckle Brothers and Yorkshire Tea all form a historical document for the culture of that decade, a rejection of the timeless idea of childhood and an exaggeration of the microtrends that we find ourselves herded through life by. This piece, in 10 years’ time, would probably feature hoverboards, fidget spinners and trampoline park logos, along with regional trends. The speed of redundancy is not only exaggerated in our movements in the space but in the work itself. Aftertaste celebrates and interrogates kitsch culture. It is honest about the fast turnover of aesthetic trends, and the subsequent relegation of these objects to ‘low culture’. It is honest about the value we assign to this unceasing supply of stuff available to those of us who can’t always afford high-end goods. Aftertaste treasures the humanity in the sentimentality we have to stuff and its cultural references, while also accepting that the constant consumerist treadmill can often feel like an impersonal indoctrination into consumption.